Code zero performance on a SO469 or similar? I tried to search for this but could not find similar thread. I have a 469 with smaller sails, roller furling Main and roller furling 106% jib. This works surprisingly well in winds 12 knots or more so far but not so great with lighter air. Has anyone used a code zero for a similar situation? Summer is coming and with the light air I am looking for better performance. Preferably with 50-100 Deg apparent wind but I am still learning about these options. Seems to cost approximately $9,000.00 US for sail with roller gear and sun protection so it is a serious purchase to consider. My SO439 has a similar high-aspect ratio rig (with 106% headsail and furling main). I am impressed with the boat speeed and handling given this set up, but off wind is sluggish, especially in light air. I borrowed a whisker pole for an offshore race and it made a huge difference even with the skinny head sail, so will be installing my own soon. - Code 0 with furler. Initially my favorite option but less so now. I think the range of benefit is a bit narrow for my purposes. May still do eventually. - Asymmetrical with top-down furler. Simple solution and may be least expensive overall but only applicable downwind. Can help racing or cruising. - Installing tracks for 120% - 130% headsail (a 409 owner did a write-up in Hints & Tips). Pricey option given the extra hardware and installation costs, but beneficial in wider range of circumstances, especially with a whisker pole. My PHRF region treats me as if I had a 140% anyway. Can help cruising and racing. I will hopefully get approval for one or more of these options. Leaning towards the asym first. We have had a code 0 on our 379 since new and would not be without it. This is the factory offer version using seldene hardware. It works from 50 to 130 degrees apparent, although I would not push my luck in winds over 13 knots when strapped all the way in. Today, sailmakers are producing code 0's with different mid height girth, to offer more or less downwind capability. I suggest you discuss your cruising preferences with a sailmaker you trust and jointly select the variation that best suits your cruising expectations. 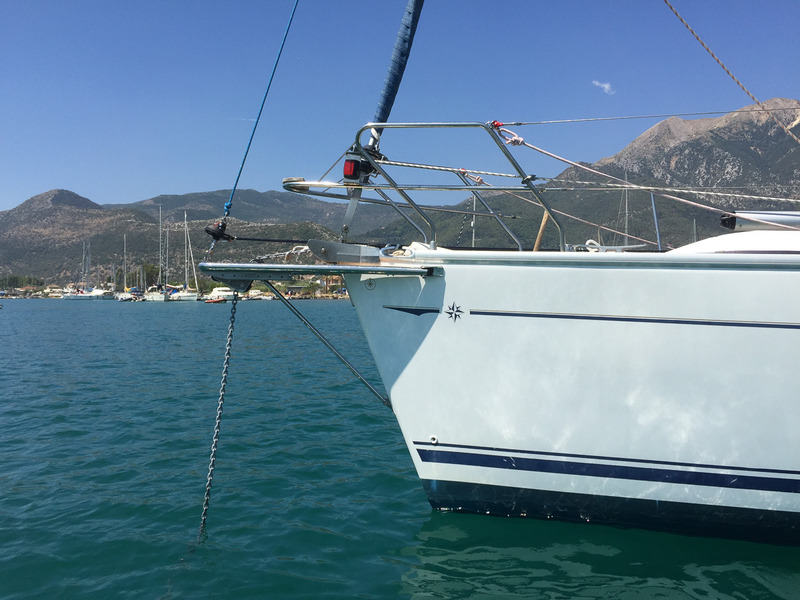 Furling asym's are fine and roll up well in ideal conditions - however they tend to produce an uneven, ragged roll ups in a blow when you need control most. They are getting better, but they are not there yet. Hence our willingness to stay with the code 0. Seems to be blend of code-0 and asym...furls like code-0 but has much wider range of application. A question back to Moonshadow - do you intend to do any PHRF handicap racing? If so, check with your sailmaker because there is a girth limit beyond which a code 0 is declared a flying sail and potentially zaps your rating. While I would check with your sailmaker for the girth part of a Code0 from a racing standpoint. One should also personally look up and make sure they too, know the girth requirements etc so they do not buy a too small 0 and get hit with the way oversized jib rating. Then again, some areas like the local PHRF-NW, if I am reading the spec correctly, they have decided ANY code 0 is a large jib/genoa, and needs to be rated as such. Fortunately with a mast head rig, I do not have this issue......but someone reading this may! jdl, how do you read the local regs? I do not compete, except for some club race. I had serious thoughts on a Code-0. But I chose a Code-1 sail instead and I'm very pleased. 40 seconds into my video you'll see my Code-1 sail. Thanks I will read more and keep asking questions here and at sailmaker’s. I used to race long ago and I have no interest in racing in the future. Without a doubt racing is a great way to learn about peak performance but my future is in cruising so the rule limits will not apply to my sail decision. We acquired a Doyle (German) regular (ORC) Code 0 with our 42i Perfomance. It has seen some use and is excellent in <10Kts winds. It is a very big sail and behaves basically as any large asymmetric, but with some extra fullness. Furles OK . It gets cleaner air if you sheet the main in a little harder than normal. The furled sail is like a stiff python to put back in the bag, but that's easier than stuffing a sail by hand! I have a Code 1 (I still have it, just no boat) which is like a code 0 made of spinnaker nylon. I bought it because I put a smaller (135%) genoa made of heavy dacron and wanted something for light air. The sail maker said it was for something like 45-100 degrees, but I would happily fly it anywhere between 35-180 degrees. To get to 35 the wind needed to be under 5 knots, but I could make good progress. The maximum deep angles quoted by sailmakers are just BS when you are cruising and don't care about optimum speeds. I treated my code 1 like a very big and lightweight genoa. If I had my time over again, I'd get a proper code zero because it can handle the close wind angles at a higher windspeed. I sail in your area (same marina) and definitely recommend some additional sail area for the summer. I waited 3 years before getting an asymmetrical on my last boat and wished I had done it sooner. This time, I bought an asymmetrical before I took delivery of the boat. I haven't used the code 0, mostly because on my last boat (no sprit) I couldn't really fit the furler without extensive mods. This boat would carry a code, but I found a used asymmetrical at a good price and with a sock it's easy enough to single hand (though probably not as easy as the furler). I'm not sure (but curious) how much difference the code 0 would make in the light air particularly when not racing and just Cruising and day sailing around the bay. I might get a code 0 in the future and if you do get one, I would be interested in hearing more about its performance. I have considered getting a furler for the asymmetrical but after speaking with a few sailmakers, Im not convinced that they are worth it - the fuller shape of the asymmetrical makes them troublesome on the furler. I decided on a code zero with a selden roller furler. Thursday afternoon the sailmaker is coming to measure for it. I went with Ullman Sails for a few reasons. The service reputation is very good and the price seems appropriate for a good sail locally made. Ullman seems to do a lot of racing sails but overall they are happy to meet and custom cut that sail for my purposes. 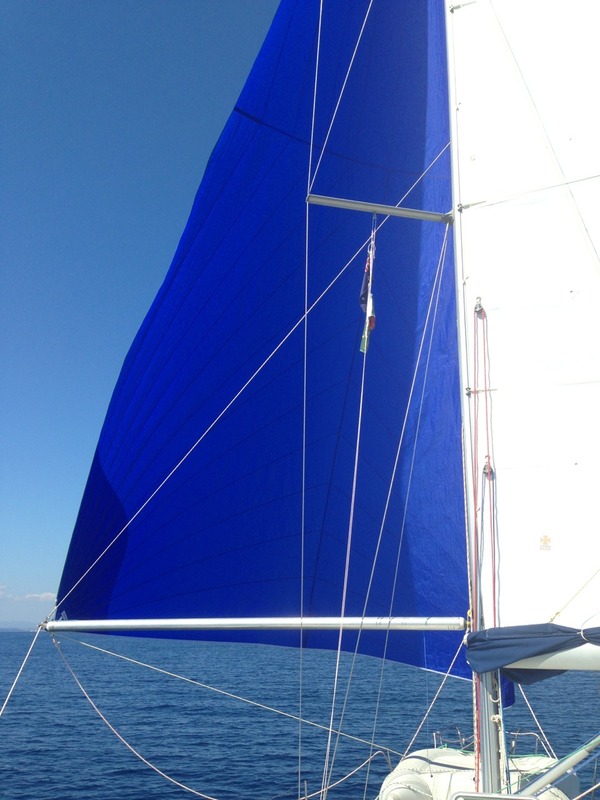 I do have a somewhat undersized asymmetrical spinnaker that works pretty well in slightly higher winds. My thought is that these two will compliment my small main and 106% jib well and if needed a proper downwind sail might be added eventually. My next decision relates to the roller furler for the code zero. There seem to be a few choices that are popular in the U.S. Ullman is recommending a selden roller system while acknowledging that there are choices. I am not racing but I do want reliability. Harken seems to have the “best” reputation but cost is prohibitive. Selden was recommended as a good quality and good value choice. Any thoughts on this before I commit? I bought the Selden CX25 for my Code 1 and when I bought a running sail (North G2) got it set up for my Selden using the top down adapter. So when cruising, the CX25 would remain mounted to the bowsprit and then I'd connect to it whichever sail I wanted to use. It saves the cost of having a Code 0 & topdown roller and the continuous line stays rigged up to the cockpit. Other brands do have TD adapters, but not all. Not sure if the CX25 is right for your boat or if you need the next size up. Sounds like the 469 has a very different sail plan to our 45DS. The tri-radial Genoa is 145% and 55m2 with a 35m2 main. Close hauled in light airs 4 to 6 knots we return about 1/2 the wind speed. DDW and poled out we can sail slowly down to 6 knots wind speed. The pole makes a huge difference and it’s not too difficult to deploy. Well, yesterday Ullman Sails delivered my code zero and the Selden CX25 roller. I will be sailing for the next few days and should be able to give the sail a good workout. I will take some photos and then learn to upload them here. Thank you all very much for the tips and advice. Interested to hear how you get on, the 469 i'm going for has the normal sized fully battened main and the 106% genoa, there's also a storm sail and an asymmetric with a snuffer (i think) not sure on the size or brand so will check that when i get onboard in mid september. A furling code zero does look like a good investment. I have been sailing with my code zero from Ullman Sails for a while now. Overall this is a great improvement in performance. 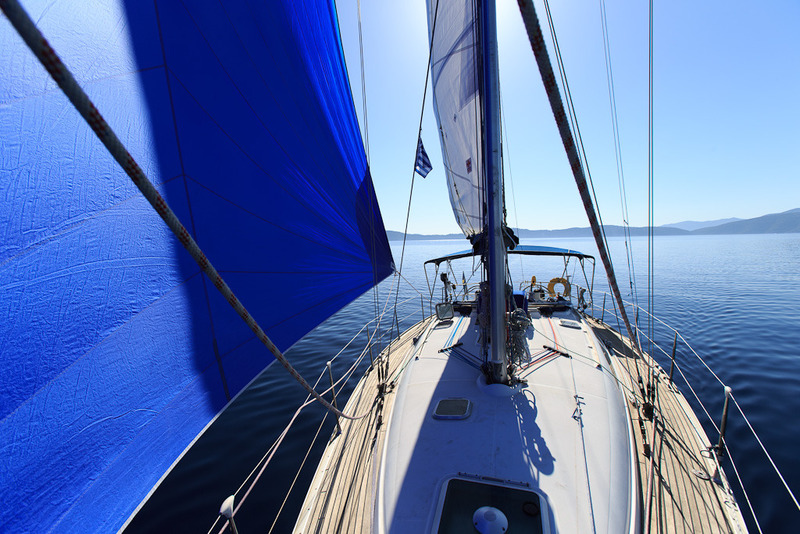 There are many light air days that are now enjoyable sailing days instead of motoring. Surprisingly the best performance is from upwind to beam reach. 30-40 degrees apparent depending on sea state feels great up to about 15 knots. My light air off wind performance is of course better than my 106 jib. And a lot better than my undersized chute. I have experimented with dead running using my zero to one side and my jib opposite. Looks cool but still deciding if this is better than heading up a bit and jibing my way downwind. Jibing the zero is easy. However there are some handling issues that I didn’t fully appreciate. First, this sail can’t be tacked since it mounts ahead of the headstay/jib. And the single line Selden continuous furling is a pain. When the wind picks up and it’s time to swap back to the jib it is a lot of work singlehanded. I need to keep some pressure on both furling lines at the same time pulling in the lazy sheet so it doesn’t foul on the furling spool. I’m working on placing some cam cleats to make this process easier. I added a stanchion mounted double cam cleat so I can tie off the zero easier. My sail also has a sunblock strip on the leech so I feel OK leaving the sail up when it will likely be needed. Honestly I leave it up most of the time. I think it interferes a bit with the jib airflow but when wind is enough for me to use the jib it makes little difference. I am really happy with quality and service from Ullman sails. They have made a few trips down to help me figure this thing out and trouble shoot my singlehanding procedures.